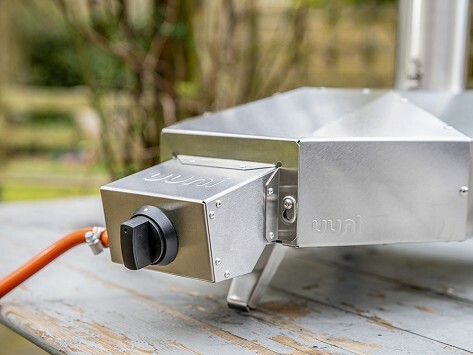 Quickly and easily convert your Uuni Original or Uuni Pro to gas with this burner attachment. With the same speed and high heat as using wood pellets or charcoal, you'll be able to effortlessly cook bread, steak, pizza and more at a range of temperatures. Dimensions: 1.1" x 6.7" x 13.5"
I was wondering if Uuni would ever make this attachment and thankfully they did! Don't get me wrong, I love the pellet option, but the pellets burn up fast and I have yet to find a way to slow them down to an amount that I want them to go...but I have managed to get them slowed down. But this option of propane is awesome, especially when we are doing multiple pizzas. We love our Uuni and can't rave on enough about it to people, especially when we travel with it over to family members houses for a pizza party. Everyone loves how fast and how perfect the pizzas come out and easy it is to travel with. We have even allowed family members to take on vacations. It has become quite the much asked for traveling companion by many friends and family members.